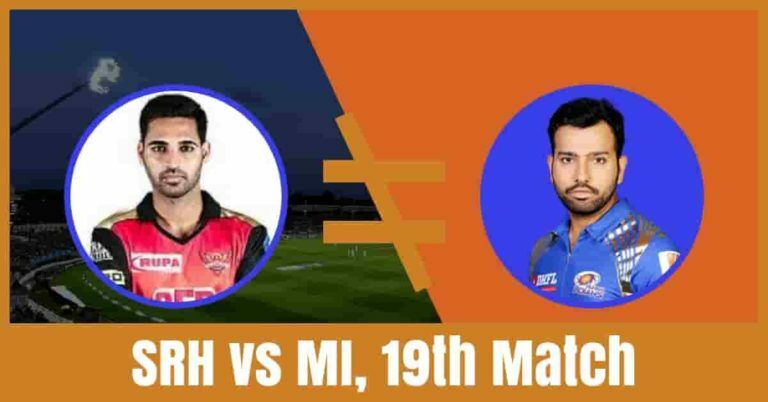 Who Will Win The Match Today of MI vs SRH 19th Match Indian Premier League 2019? The second match of the doubleheader day. Sunrisers Hyderabad is all set to take on Mumbai Indians on Saturday, April 06, 2019, at Rajiv Gandhi International Stadium, Hyderabad. We will also cover who will win today? Dream 11 Free grand league teams, Sunrisers Hyderabad vs Mumbai Indians full squad, MI vs SRH latest news, the best choice for captain and vice-captain and all the details you need to win any fantasy cricket league. All the details in this post are very accurate and taken from very reliable sources. Make sure to read the post carefully if you want to increase your chance of winning to 100%. Sunrisers Hyderabad had a great start in the 12th season of Indian Premier League. They are in the first position if the points table with 6 points in their pocket. They have played 4 matches, won 3 and lost one game. They have won their last match against DC by 5 wickets. Prior to that, they have won against RCB by 118 runs, won against RR by RR by 5 wickets and lost against KKR by 6 wickets. David Warner, Jonny Bairstow and Vijay Shankar are the top scorers of Hyderabad. They have scored 264, 246 and 100 runs. Mohammad Nabi, Sandeep Sharma, Rashid Khan are the top wicket-takers. They have taken 6, 5 and 3 wickets respectively. On the other hand, Mumbai Indians had witnessed a mixed result winning two out of four matches. They have won their last match against CSK by 37 runs. Prior to that, they have lost against KXIP by 8 wickets, won against RCB by 6 runs and lost against DC by 37 runs. 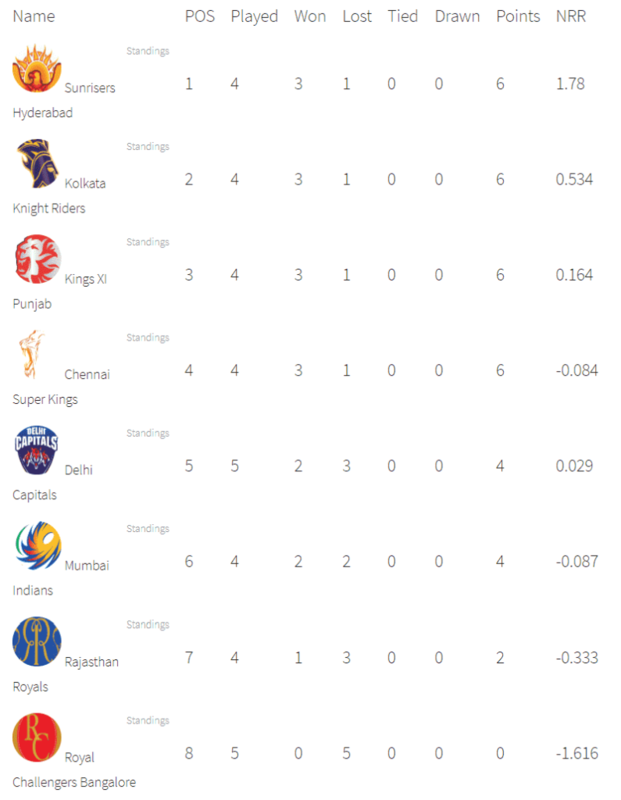 Quinton de Kock, Suryakumar Yadav and Rohit Sharma are the top scorers of Mumbai Teams. They have scored 114, 110 and 107 runs respectively. Jasprit Bumrah, Hardik Pandya and Jason Behrendorff are the top wicket-takers. They have taken 4, 4 and 2 wickets. Quinton de Kock, Suryakumar Yadav, Rohit Sharma, Krunal Pandya, Hardik Pandya, Jason Behrendorff and Jasprit Bumrah are the key players of Mumbai Indians Team. Lasith Malinga is not available for today and the next three matches. Mitchell McClenaghan will replace him in the playing 11. Either Rahul Chahar or Mayank Markande will play. Ishan Kishan may replace Yuvraj Singh. Mitchell McClenaghan, Jason Behrendorff and Jasprit Bumrah will lead the bowling department. hardik Pandya and Rohit Sharma are the most valuable players of the Mumbai team. Batsmen: Suryakumar Yadav, Rohit Sharma, Kieron Pollard, Yuvraj Singh/Ishan Kishan. Bowlers: Jason Behrendorff, Jasprit Bumrah, Mitchell McClenaghan, Rahul Chahar/Mayank Markande. Rohit Sharma(c), Jayant Yadav, Quinton de Kock(w), Jason Behrendorff, Suryakumar Yadav, Ishan Kishan, Yuvraj Singh, Siddhesh Lad, Krunal Pandya, Pankaj Jaiswal, Hardik Pandya, Ben Cutting, Kieron Pollard, Barinder Sran, Rahul Chahar, Anmolpreet Singh, Mitchell McClenaghan, Anukul Roy, Jasprit Bumrah, Mayank Markande, Aditya Tare, Rasikh Salam, Evin Lewis, Alzarri Joseph. David Warner, Jonny Bairstow, Vijay Shankar, Mohammad Nabi, Rashid Khan and Bhuvneshwar Kumar will lead the Sunrisers Hyderabad Team. Jonny Bairstow, David Warner and Manish Pandey will lead the batting department. Mohammad Nabi and Vijay Shankar will play as a key all-rounder. Rashid Khan, Bhuvneshwar Kumar and Siddarth Kaul will lead the bowling department. Batsmen: David Warner, Yusuf Pathan, Deepak Hooda, Manish Pandey. All-Rounders: Vijay Shankar, Mohammad Nabi. Bowlers: Sandeep Sharma, Rashid Khan, Bhuvneshwar Kumar, Siddarth Kaul. Bhuvneshwar Kumar(c), David Warner, Shakib Al Hasan, Jonny Bairstow(w), Martin Guptill, Vijay Shankar, K Khaleel Ahmed, Manish Pandey, Billy Stanlake, Kane Williamson, Abhishek Sharma, Deepak Hooda, Wriddhiman Saha, Yusuf Pathan, Shreevats Goswami, Mohammad Nabi, Siddarth Kaul, Rashid Khan, Basil Thampi, Sandeep Sharma, Ricky Bhui, T Natarajan, Shahbaz Nadeem. The pitch Rajiv Gandhi International Stadium, Hyderabad is a batting paradise. The batsmen will find it easy to score runs on this ground. The spinners may get some help from the wicket in the latter half of the match. Dream11 Fantasy Cricket Tips: Try to take pinch hitters in your teams. The weather of Hyderabad is forecasted to be mostly sunny and it will remain the same throughout the day. The sky will be clear and there is no sign of rain. A hot and humid day is predicted. The temperature is expected to be 33-Degree Celsius and the humidity to be 34%. Dream11 Fantasy Cricket Tips: The weather condition may favour the batsmen and spin bowlers. Sunrisers Hyderabad has won both the matches last season of IPL. They have won back to back three matches against Mumbai Indians. If we look at the statistics of the last five matches between srh vs mi, mi has won one game and srh has won four matches. According to Crix11 astrology cricket match prediction, SRH will win the match. The team winning the toss should opt bowl first as the team batting second have won 34 matches out of 58. According to crix11 astrology prediction, MI will win the toss and opt to bowl first. This is it for Today’s SRH vs MI Dream11 Fantasy Cricket Prediction 19th Match. What is your best team? What do you think Who Will Win Today? Leave a reply in the comment section.